Happy Halloween, All Saints Day and All Souls Day! This certainly is a wonderful week of recreating and remembering. Halloween allows us to recreate ourselves with costumes, while All Saints and All Souls Days help us to remember those who have gone before us. Recently I saw some photos with my friend Sr. Jeanne Marie Gocha, CSJ, when we visited the Hallmark Museum. There were many creative things to enjoy and learn about as we wandered through this fascinating place. The photos got me thinking about the gift bag they gave us at the museum. It had these words printed on it: “We Create Ourselves as We Go!” The operative word here is GO. In religious life, in any life really, there needs to be constant movement toward the goal of a deeper union with God. And, we must create and re-create ourselves along the way. Not much is accomplished by going backwards. We should try to avoid getting caught in a rut. I heard it once shared that a rut is a shallow grave. I don’t know about you, but that is not where I want to spend my life. None of us really likes change, but perhaps we can see where staying in a rut or living in our comfort zone leads us nowhere. God is with us and only wants the best for us. We are often reminded that we are all called by God, called by name. In order for the fruit we produce in God’s name to last, we must be willing to “create ourselves as we go.” We must believe that we are worth our calling. No matter what, we must never give up being a witness for the Kingdom of God. The challenge, however, is to continue to “create ourselves as we go.” Whatever God leads you to, He will lead you through. Your challenge this week is to sit with those things that stop you from creating and recreating yourself as you go. Is it fear? Lack of trust in God’s plan? Comfort? Emptiness? Lack of joy? Only you can answer these questions. It is then that you can plant some seeds in the shallow grave of your rut and nourish them with prayer, friendship and trust. The new growth will fill the rut with new life. Happy creating and recreating! And, have some fun doing it. The Creator of your life will be overjoyed. 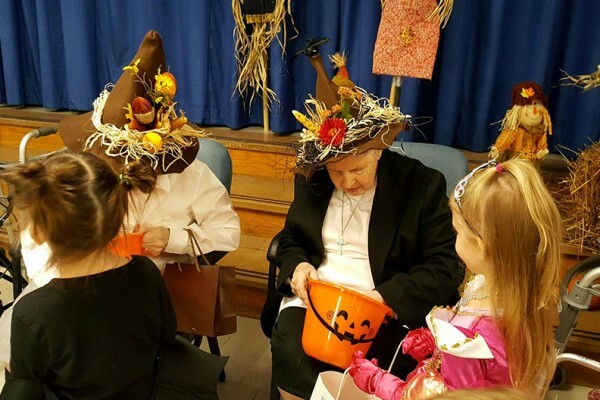 Photo: Sr. Florence Klaniecki, CSFN, sharing treats recently at The Community at Holy Family Manor.